Hello! I am Maggy from over at Red Ted Art and I am so pleased to be guest posting for you today! 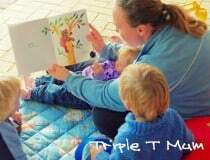 I love Creative With Kids – so many beautiful and fun ideas to inspires to get crafty with the children. Over at Red Ted Art, I love to get crafty in an inexpensive and economical manner – always upcycling items from around the home, from nature walks or from the office (from the days when I was still in an office). Actually, I am a bit of a hoarder.. so I have lots of bits and bobs that others may have thrown away by now. It is very important to get some order in your stash.. but I am digressing. I have two favourite materials to craft with: Cardboard Tubes and items from Nature (pine cones, stones, sticks…). And I would love to share some of these with you here today! We often are inspired by books. And we made these cardboard tube zoo from toilet rolls. All we needed as little extras, was paint, a little felt (optional) and googly eyes (optional – I actually prefer the ones were we used paper for eyes). Your kids get to paint, you can help with the cutting and they can stick. 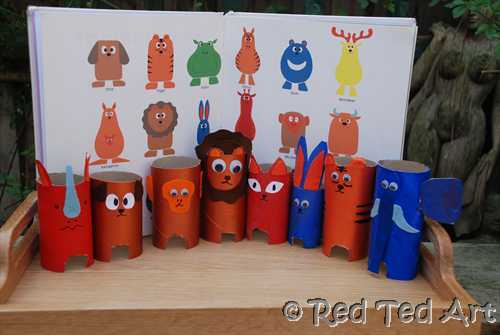 Find more details on the cardboard tube zoo post over on Red Ted Art. 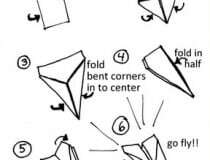 Now, I know this photo is “super simple”, but that is because this craft is indeed super simple. And yet, it really captured the imagination of my children: Cardboard Tube Watches! You can even make the hands of the watch move by adding little pins. Or you could decorate the straps with gems. We actually made the above in a mere 5min. Really. A quick craft. Hours of play. We liked these so much, that I even used it as the cover of my “Time on Your Hands” ebook. A whole ebook based on the humble Cardboard Tube! But before you go on a nature walk. You need a Nature BAG!!! We made one recycling an old sweater! 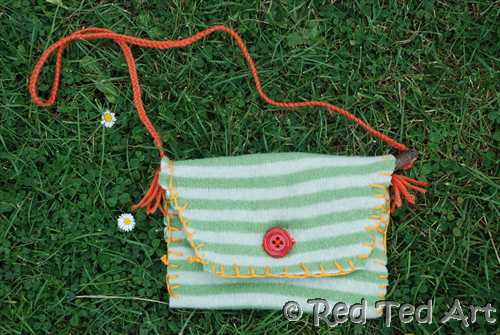 This bag is also a great way to start children on sewing projects. My son adored having a go. The rest of this sweater was made into a cupcake and a Christmas stocking!!! So.. once you have your Nature Bag.. off you go and see what you can find. At this time of year, it will be mainly sticks and stones…. one of our favourite crafts ever, are these (again) so simple Stick Men. They were inspired by the book “Stick Man ” and we had so much fun making them and then playing with them. Amazing what some googly eyes can do! My children LOVE stones. I think they just have something beautifully tactile. You can make your stones into monsters. 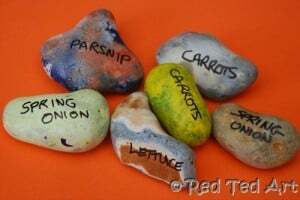 You can “melt crayons” onto them and make paper weights (heat the stones in the oven and then hold the crayons on… I haven’t got a picture, but they do look lovely!). Or as Spring is around the corner (I think), how about some Stone Planters? I do hope you like my round up of inexpensive crafts. Just take a look around your house. She what you have and be inspired to get crafty!! I would love for you to stop by at Red Ted Art one day too! It was great to be visiting you today! Love these upcycled, recycled crafts! And simple, too! For us that is good as my son has Down syndrome! Love the pics, too! 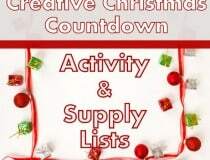 I will be pinning this (https://pinterest.com/lnmontessori/) on my Upcycle… board and then trying them out with my son! These are all really cute ideas. i especially love the stick men. Really lovely ideas. We might make the watches this afternoon. Such great ideas Maggy!!! I want to make those stick men. Pinning them now! Love, love, love these! We make owls from toilet rolls – you push the tops in and you are left with ‘pointy bits’ at either side which suggest an owl. They have been a huge hit with the resident seven year old and friends who come over to play and do craft. I love the stone planters – no need to worry about those getting blown away! These ideas are awesome!!! My daughter loves to go outside and pick up things and I’ve never thought of making her a bag and doing crafts with her “findings.” Thanks for sharing these. Great ideas!! I especially love the rock garden markers!!! Those stick men are hilarious! I think we can do those watches with all my leftover Starbucks sleeves! Great guest post, Maggie. So fun! I have been enjoying doing crafting with my three year old Collette. We are going to try out the zoo animal tubes! Thanks so much for sharing.